미호종개가 신종으로 발표된 1984년에는 분포지역은 미호천의 충북 청원군 관내 수역으로 매우 제한되어 있었지만 서식 개체수는 풍부하였다. 하지만 현재는 본 수역에서 거의 사라졌으며 추가 분포지로 확인된 유구천에서도 극소수가 서식하고 있는 절멸의 위기에 처한 어종이다. 급격히 감소한 원인은 모래 채취에 의한 서식처 파괴와 수질오염 때문이다. 미호천의 충북 청원군 수역과 유구천의 충남 공주군 사곡면 수역등지에 분포한다. 유속이 완만한 수심 1m미만의 얕은 여울에 서식하며 산란기는 5∼6월로 추정된다. 몸길이는 약 60∼80mm로 몸의 중앙은 굵지만 앞쪽과 뒤쪽은 가늘고 길다. 주둥이는 뾰족하게 돌출되고 입은 주둥이의 밑에 있다. 입수염은 3쌍이고 짧으며 옆줄은 불완전하다. 몸의 바탕은 담황색이고 몸의 옆면 중앙에는 12∼17개의 원형 또는 삼각형모양의 반점이 있고 등지느러미와 꼬리지느러미에는 3줄씩 암갈색 반점열이 있다. 농·공·축산 및 생활 폐수로 인한 수질오염으로 인하여 미호천에서는 거의 사라진 상태이며 유구천에서는 최근의 집중확인조사 결과 수개체가 확인되고 있을 뿐이다. 분포범위가 극히 제한되고 서식 개체수가 희소하며, 서식환경의 변화에 매우 민감하여 현재 멸종위기에 처했다. 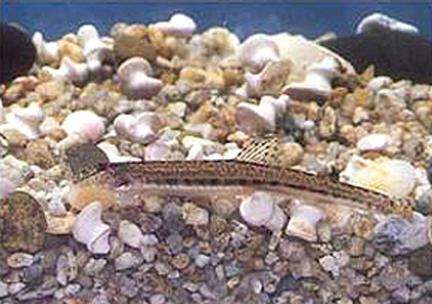 The Miho Spine Loach (Cobitis choii) was reported as a new species in 1984. At the time, they were found in large numbers even though their habitat was limited to that part of Mihocheon Stream in Cheongwon-gun, Chungcheongbuk-do. Now, however, this species is threatened since it has almost disappeared from Mihocheon Stream and only a few are known to exist in Yugucheon Stream. The rapid decline in numbers is attributed to the destruction of habitat and pollution of the water due to sand collection. The known habitats of the miho spine loach are Mihocheon Stream and Yugucheon Stream in Sagok-myeon, Gongju, Chungcheongnam-do. The fish live in shallow pools less than 1m deep in waters with slow currents and lay their eggs in May-June. It is 60-80mm long, thick in the middle, and thinly tapered at the head and tail. It has a pointy, protruding snout with the mouth underneath and three short whiskers on either side. The body is pale yellow with 12-17 round or triangular spots in the middle and 3 rows of dark brown spots on the back and tail fins. Because of wastewater from industries, agriculture, farming, and from households, Mihocheon Stream has become severely polluted, and studies have failed to locate a single miho spine loach in the stream in the past two years. Several have been found in Yugucheon Stream only. With its severely limited distribution range and very low numbers, the miho spine loach, which is very sensitive to changes in habitat, is now in danger of extinction.